It turned out that Vivek’s pal, SAADA President Samip Mallick, was working on SAADA with, among other people, a friend of a friend of mine, Manan Desai. The two of them agreed to do an interview about it for Sepia. This interview was conducted via the standard Interwebs.VVG: Thanks so much for doing this chat. As you know, I think this is a really cool project–I’m the kind of person who can fall into the wormhole of the Internet pretty quickly, especially when it comes to Fun Historical Facts (or… Less Fun Historical Facts From Which We Might Learn). This site has such great potential… can you tell us a little bit about how you got started? Samip Mallick (SM): Sugi, thanks so much for inviting us! Our organization, the South Asian American Digital Archive (SAADA) was started in 2008 based on what we saw as a very critical need in our community. There were at that time… and continue to be to this day… no other archives that are working to systematically document and preserve the history of the South Asian American community. And, as a result, we feared that this important history was in danger of being lost. Our mission is not just to document and preserve the history of our community, but also to ensure that these histories are more widely known to everyone, especially within our own community. It seems like we’re always coming across really fascinating stories that we just had no clue about. And we feel like having a greater understanding of the history of our community will give us a better sense of not just who we were, but of who we are today and who we aspire to be. Manan Desai (MD): I agree, and I think accessibility is one of the central ideas behind our project. There’s something really gratifying about providing access to historical materials directly to the public without a great deal of mediation. Our goal is to allow the reader to confront and understand the material for her or himself. VVG: What are your personal favorites in this collection? I got a kick out of seeing a younger version of SM’s own Taz, working for SAAVY. 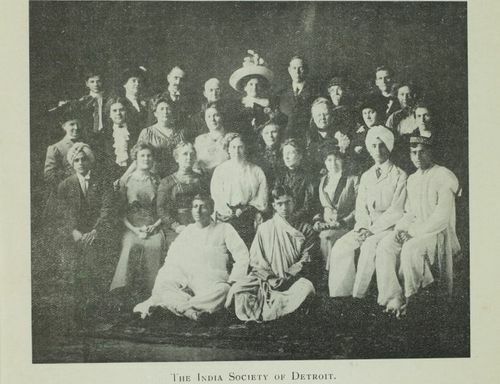 I also love seeing the history connected to the University of Michigan, of course, since I teach there (and you’re both connected to the university too)… “The India Society of Detroit” info was pretty awesome. What were the biggest surprises for you as you started gathering material? 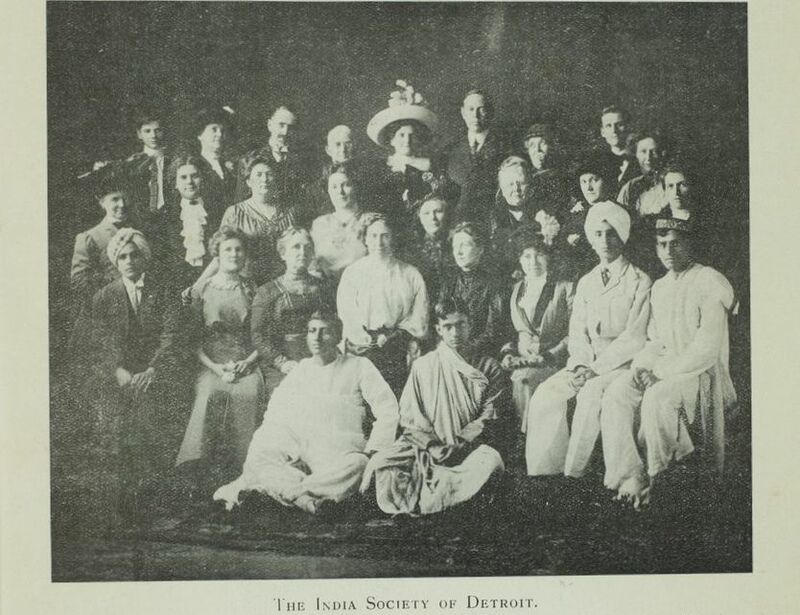 MD: “The India Society of Detroit” material was really interesting and totally surprising. Having grown up outside of Detroit, I didn’t expect to see such an early presence of South Asians in the city all the way back in 1911, let alone read about it in a Calcutta-based publication like the Modern Review. We’re trying to follow that trail even further. SM: One of the collections that we’re processing right now is one that I’m particularly excited about because it’s a fascinating history that I just didn’t know anything about. The Watumulls are one of the first South Asian families to settle in Hawaii. Jhamandas Watumull moved to Hawaii in 1913 and opened a retail store in downtown Honolulu that would eventually be named the “East India Store.” The store flourished, selling raw silk goods and “aloha shirts” on the island, turning into a major department store, before eventually opening additional branch stores in Waikiki and in downtown Honolulu. The Watumull family also has made a huge and lasting impact on Hawaii through their philanthropic work, supporting the arts, education and other causes. We’ve been working with Mrs. Indru Watumull to document and preserve their family history and these materials are now being published online in our archive. What was wonderful about working about the SAAVY materials is that Taz had been very diligent and forward-thinking and had carefully maintained a variety of SAAVY’s organizational materials even after her work with the organization had ended. In addition to digitally preserving and providing access to historical materials, we would also like to work closely with the community to create a greater understanding of the importance of archiving as well as what it takes to ensure that materials, both digital and non-digital, are preserved for the long term. VVG: You guys recently sent me a note saying you’d gotten a great grant. Tell us a little about the support you’ve gotten in the past and the kind of support you’re looking for, especially from the likes of our SM readers. If someone has material they want to digitize and submit, is there a process for doing that? What makes the cut? Or are you just digitizing everything you find so far? SM: Yes! In fact it was our first grant, which we’ve received from a local philanthropic organization in Chicago called the Asian Giving Circle (AGC). AGC members each commit to donating a minimum of $250 a year for at least two years, and the funds are then allocated in a grant competition to support organizations working within the Asian American community in Chicago. What was really wonderful for us with this grant was the opportunity to meet many of the members of the Asian Giving Circle who had given money out of their own pocket to support our mission of preserving history. The work that we do is a labor of love for all of us involved. We’re an entirely volunteer-run organization. But, of course, like other non-profit organizations, we rely on the generous financial support from those who value the work we’re doing. MD: Some of our more interesting collections have come from people just tipping us off about a story that we then follow. 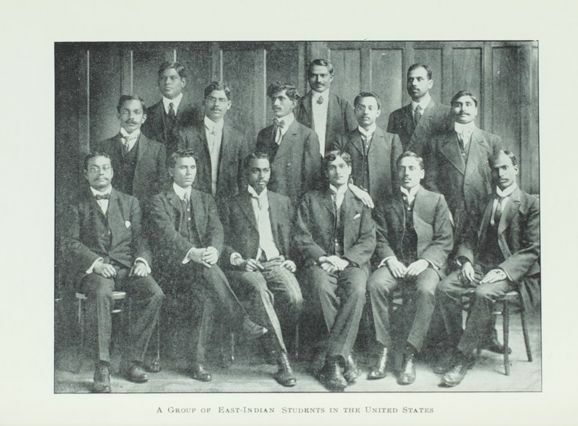 We’ve recently started a collection on the Bellingham Riot in the state of Washington, in which a white mob attacked and ousted hundreds of South Asian settlers in 1907. This archival work is being done collaboratively with Professor Paul Englesberg, who lives in Washington, has been recovering and documenting a lot of this history himself and was eager to share his findings. If anyone has an idea of something to pursue, let us know! VVG: Relatedly, any spaces in your collections that you’d particularly like to fill? Any challenges with any particular communities or types of material? MD: There are still a lot of gaps to fill. For one, there’s a real, ethical obligation for our generation to document the struggles of South Asian communities, and particularly Muslim and Sikh communities in the aftermath of 9/11. We’ve actually recently begun working with SAALT (South Asian Americans Leading Together) to do just that. It’d be also incredible if we could do larger collections on some key South Asian enclaves in the U.S.–Jackson Heights, Edison, Hamtramck, Devon Avenue. We are also mindful that South Asian American can easily become an euphemism for Indian American, and we’d like to avoid that by recognizing the diversity in our community and being engaged with the community at the broadest possible level. VVG: I really appreciate your conceiving and executing this as a South Asian American project. What led to it being framed that way, rather than around any one specific community, ethnicity or nationality? MD:One of the aims of SAADA was to investigate the history of South Asians in the United States in terms that are more specific and grounded than dominant narratives that have rendered the community into one homogeneous group. The category “South Asian American” isn’t perfect, but our aim in using it is simply to be as inclusive as possible. VVG: Where would you like this project to be in ten years? SM: First and foremost, as an archive we enter into a bond of trust with the community we serve to ensure that the digital materials in our possession are well taken care of and preserved. As those who’ve dealt with anything digital are very well aware, technology and software are changing at a breakneck speed. That will be plainly evident, for example, if you try to open a Pagemaker file or access a Geocities website. As a digital archive one of our primary concerns is to ensure that even if software changes or the way people visit our archive changes, the digital materials we care for will still be accessible to the public. Our other major goal is to work closely with the South Asian American community to ensure not just that we do a better job of documenting, preserving and providing access to our history, but to work together to ensure that our stories are told and retold for future generations. This entry was posted in History, Identity, Issues, News, Politics by V.V.. Bookmark the permalink. Wow, thanks for the interview. Hadn’t heard of SAADA before. Having recently come across Tasveer Ghar (which is obviously not exactly the same), I’m happy to learn about something in the same ballpark that’s about South Asian America(ns). For an all-volunteer project, they really seem to have gained a lot of steam… I know other (again, different) projects like the Kahani Movement or whatever, and Kavita Daiya’s 1947partition.org, all seem to have fizzled out pretty quickly. Also, wanted to thank you for the previous post about Anika and the libraries. As a fellow library enthusiast, the video brought tears to my eyes, and the accompanying Star article was great. What a badass, so adorable, with a real sense of humor, too. Also couldn’t help chuckle that she has the same bushy hair that I did at 14. I’m amazed. 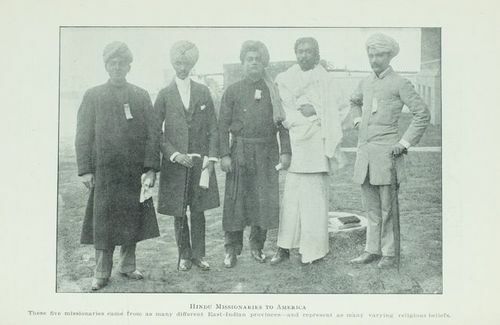 These photos verify that, relative to the Americans of the time, these Indians were less fobby than the Indian emigres of today. I’m watching Ken Burns’ Baseball, and it’s really fascinating to see the photos there too, because some of the fans were just as rabid and drunk as they are now, but they dressed so much better. Thank you so much for sharing this site. I didn’t know it existed! Glad you guys are finding it as interesting as I do! I’ll be curious to hear if any of you have ideas for materials that could be archived. This is an incredible post! I love all the links you have here. What a fascinating look into the past. Thanks, V. V., for blogging about this. 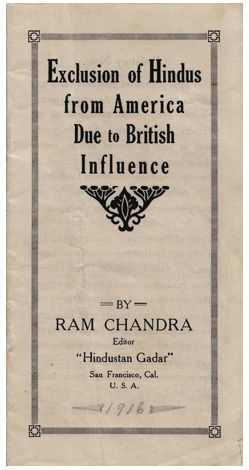 This is truly a treasure trove for anyone interested in the history of South Asian immigration into the US. Imagine the plight these immigrants faced, colonized in their home country and then segregated again in America. I have met many desi’s who have settled here, completely unaware that many of the liberties they take for granted, were only granted to them very recently.